Before we begin, there were a few regrettable exclusions. I would have loved to include Monty Python's The Meaning of Life and Oldboy but, alas, they feature characters eating alone. I was looking for the communal experience. Misery loves company, after all. Julie Taymor's adaptation of Titus also came close, but I decided one Anthony Hopkins movie was enough. Plus, it frankly doesn't belong in the same category as the five that were ultimately chosen. 5) Indiana Jones and the Temple of Doom (1984) - Steven Spielberg and George Lucas must have been cackling like a pair of naughty school children while assembling their nightmarish Indian banquet from this second Indiana Jones adventure. After all, with a menu that includes such delicacies as chilled monkey brains, eyeball soup, beetle innards and "Snake Surprise," there must have been precious little doubt that audiences would squirm, wince and retch until scene's end. 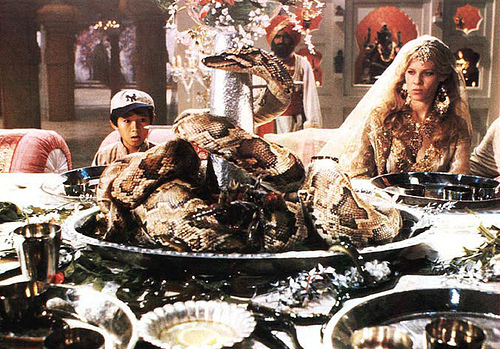 It wound up being one of Temple of Doom's most iconic moments, and ensured that we would never again have to wonder what it would look like to see a grown man scarf down a live eel whole. Ick. 4) Alien (1979) - Was it not punishment enough that Kane (John Hurt) had to spend a couple days confined to the infirmary with a giant space insect suckered to his face? Could he not just be left alone to enjoy a pleasant dinner of freeze-dried rations with his friends and co-workers? Apparently not, as director Ridley Scott soon subjects the poor sap to the worst case of indigestion known to man. When that toothy creature explodes out his chest, spraying the table with showers of gore and entrails, all semblance of calm is instantly eradicated, along with our appetites. 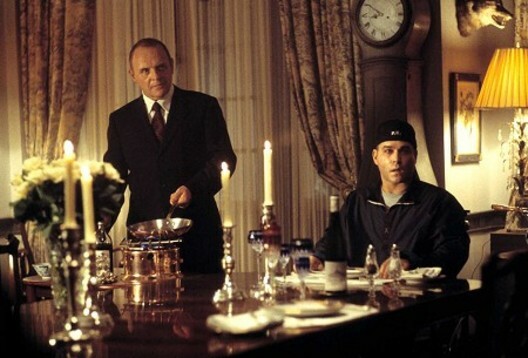 3) Hannibal (2001) - This Silence of Lamb sequel paid off its predecessor's unforgettable closing line "I'm having an old friend for dinner" tenfold. Although the movie itself is a pretty mixed bag, it's doubtful many will ever forget the sight of a dazed Ray Liotta, sans the top half of his skull, being fed sautéed chunks of his own sliced-off grey matter and savouring every stomach-turning, squishy chew. Thomas Harris' original novel had Julianne Moore's Clarice eagerly joining in on the brain-food feeding frenzy but, fortunately, director Ridley Scott (who, judging from #4 as well, apparently has a thing for gross-out meal gatherings) spares us that sight and instead provides us with a relatable dinner party member; one who makes no effort to shield her revulsion. Too bad she's not present at the film's end when an escaped Dr. Lecter (Anthony Hopkins), aboard a flight, offers his leftovers to an impressionable young seat-mate. 2) The Texas Chainsaw Massacre (1974) - A dinner party requires great company to succeed, so what happens when the company consists of a screaming family of inbred hillbilly cannibals? Such is the scenario faced by Sally Hardesty (Marilyn Burns) in director Tobe Hooper's horror masterpiece. Awakening at a dilapidated table, shackled to a chair made from human remains, the hysterical heroine shudders and screeches in terror as the villainous family of man-eating mass-murderers hoot, howl and paw perversely at her blood-stained hair. 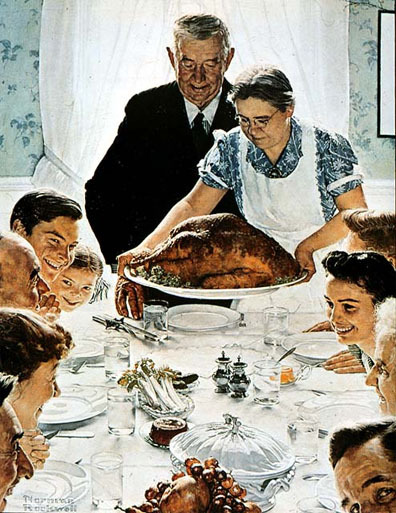 As if that wasn't bad enough, set right in front of her is a plate of unpleasant meat products of questionable origin. Why, it's enough to send a poor soul shrieking like a banshee into the night! Not surprisingly, Sally soon does just that, without thanking her hosts on the way out. Unsurprisingly, this situation was repeated in future sequels/remakes/prequels - probably most gruesomely in 1986's The Texas Chainsaw Massacre 2 - but none were as potent as the originator. 1) Eraserhead (1977) - There are few greater discomforts than having to eat dinner at a prospective romantic partner's parents' house. The potential for awkwardness alone is enough to make anyone break into a sweat. David Lynch, who's rarely stooped to subtlety in exercising his gift for mutating the mundane into the sickening, uses his audacious debut to create the mother of all disturbing family dinners. 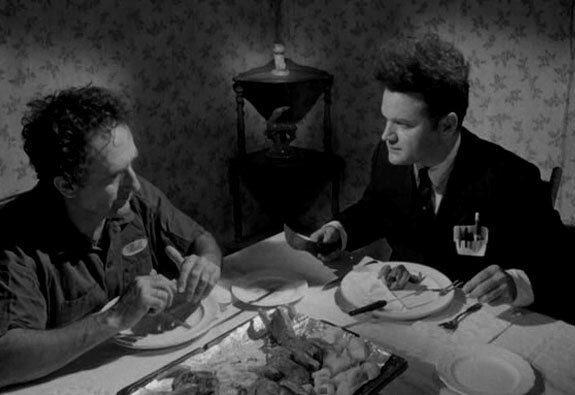 In Eraserhead, Henry Spencer (Jack Nance) is urged, by his girlfriend's seemingly lobotomized plumber father (Allen Joseph), to carve a pathetic genetically modified chicken. Just as he's about break the skin, the tiny morsel's legs start to kick, and slick black, bubbling blood begins to ooze out all over the spotless white plate. Then mom (Jeanne Bates) starts spasming like Linda Blair. It's a repulsive sequence which is, troublingly, merely just a hors d'oeuvre for the plethora of cringe-inducing horrors still to come.